Imagine, the sun rises, the sun sets, the night sky appears along with the sound of the water washing on the shore or the buzz of bees in the flowers. There are little gizmos that do this, or you can load an app for that. 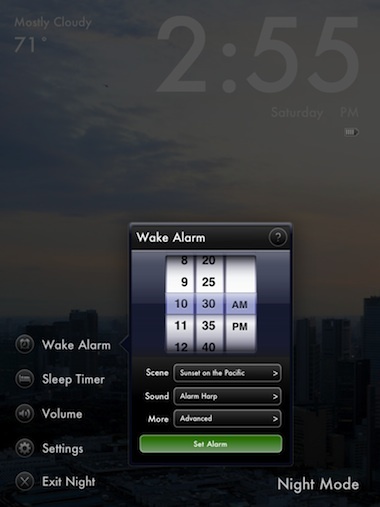 Throw in a clock and weather feature and you have a iPad working for you on the night stand at home or on the road. The single Universal app, MagicWindow will give your iPad and iPhone the ability to lull you to sleep and wake you up through scenes from around the world. 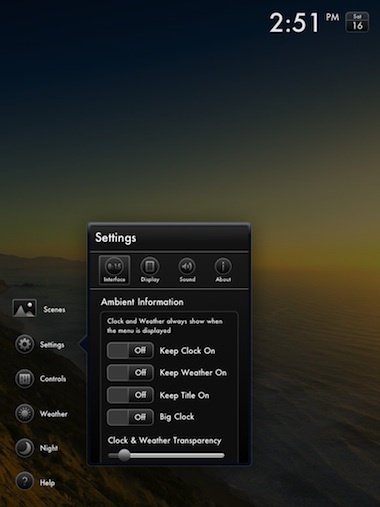 You can adjust the quantity and size of the information on the screen in either landscape or portrait views. The addition of a weather forecast can be fine tuned with location and amount of information shows. A great feature when you travel. If your in Texas and living the more than 30 days of over 100 degree weather you may not want to wake to the reminder! 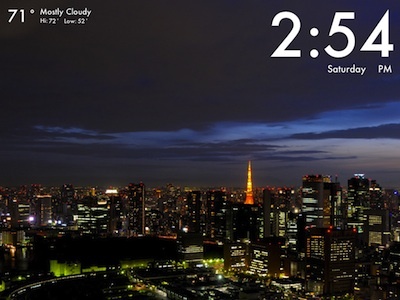 Below is the larger clock view MagicWindow offers. 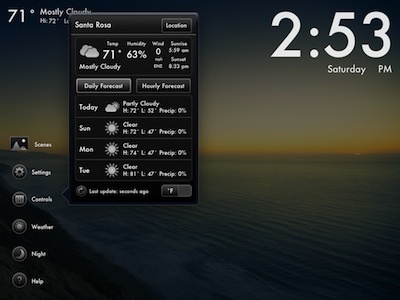 The larger clock and weather forecast showing on the iPad in MagicWindow landscape view. The scene is early morning over the city, the sun will rise and building lights will go out till night comes again. The length of a ‘day’ on the screen is adjust able so you can enjoy a long sun rise or just a few seconds to get the day started. No reason to have to have multiple apps, one to sleep and another to wake up. MagicWindow can act as a wakeup alarm too. 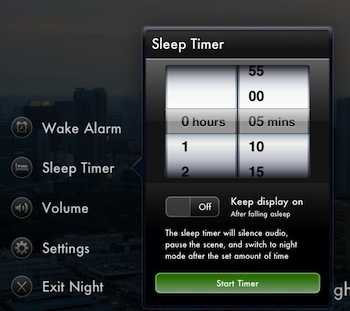 Adjustments can be made to time, alarm sound and what scene will be presented when it’s time to wake up. All of this can help a light or heavy sleeper. A nice ‘night’ MagicWindow feature if you have your iPad in a stand on the night stand is the ability to set how long the scene will stay on. This lets the scene and sound to stay on long enough to fall asleep but drone on all night. 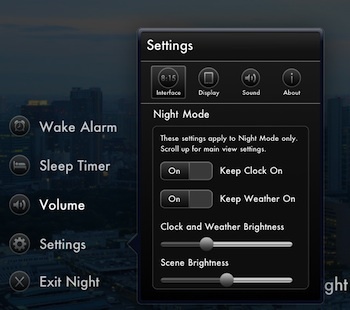 Additional settings for the night mode in MagicWindow is to fine tune what is shown on the screen when in the night mode and how bright things on the screen should be. You will want to tune this in a dark room so you know it is readable but not lighting up the whole room. When MagicWindow is installed on an iPhone and in the ‘night’ mode, a button appears on the screen to turn on/off the camera light to use as a flashlight.